The benefit of strength training for older adults is well-understood and should become a part of your lifestyle and fitness regimens. While a reduction in strength is often considered an inevitable part of getting older, Dr. Donovan says that people of all ages should feel empowered to take charge of their overall health as they age. Incorporating a healthy diet and regular check-ups with a physician and physical therapist are a critical part of active aging. Your exercise regimen should include elements of strength and resistance training to help slow the effects of aging. Rebuild Muscle: Whether we like it or not, we lose muscle mass as we age. This is known as ‘sarcopenia’ and it is the most important cause of functional decline in older adults. The loss of muscle mass can be slowed and even reversed through strength and resistance exercise. And of course, a stronger body has a direct impact on fall prevention and independence. These are all major components for successful active aging. Reduce Fat: As we age, our body naturally stores more fat than muscle. A long-term study determined that increased fat mass is associated with accelerated loss of muscle mass over an 8-year timeframe. The good news is that older adults can gain muscle mass through strength training, while experiencing a reduction in body fat. Reduce Blood Pressure: Strength training is a great (and natural) way to reduce your blood pressure. Many people use medications to control high blood pressure. Ask your physician if you can use exercise to wean off blood pressure medication. Remember, exercise is medicine too! Improve Cholesterol Levels: Strength training can actually help improve the level of HDL (“good”) cholesterol in the body by up to 21%, while simultaneously helping to reduce levels of LDL (“bad”) cholesterol. Strengthen Mental Health: This goes for all exercise, including strength training. Maintaining a high level of fitness can combat anxiety, depression, stress, etc. Exercise is also great for memory! Take a friend out for coffee, or better yet, take a friend for a walk! “Whether walking, jogging, hiking, dancing, etc., we recommend 30 minutes of weight-bearing activity every day,” Dr. Donovan said. “It’s also necessary to set aside another two-to-three days of strength and resistance training each week. This can include free weights, weight machines, pilates, yoga, and so on.” Try to incorporate multiple joints (eg squat) with minimal rest breaks to keep your heart rate up. 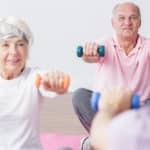 Dr. Donovan adds that a thorough strength, movement, and balance assessment should precede any new exercise regimen, especially for older adults with a variety of issues. This type of comprehensive and preventative assessment is routinely performed by a credentialed Physical Therapist, such as Dr. Donovan at Heather Lane Physical Therapy.